The GCF is an industry-recognized organization trusted by cellular network providers to certify the conformance of cellular handsets. Such approval ensures that handsets operate as specified with the wide range of base station hardware installed by network operators. Most recently, the GCF announced the inclusion of cellular (LTE) based vehicle-to-everything (V2X) and vehicle-to-vehicle (V2V) communication technologies within its certification program. This certification focuses specifically on LTE sidelink, an adaptation of core LTE standards as defined in 3GPP Release 14 that allows communication between two or more nearby devices. It can be provided on any LTE band with the 5.9 GHz band allocated for intelligent transport system (ITS) services. 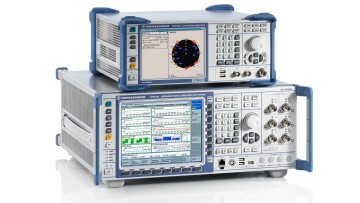 Rohde & Schwarz is the first test and measurement equipment manufacturer to meet the GCF test platform approval criteria (TPAC) for C-V2V protocol conformance testing. The certified solution brings together established Rohde & Schwarz hardware platforms and additional software. On the wireless communication side, the R&S CMW500 wideband radio communication tester supports both LTE-A and WCDMA/HSPA+ technologies as well as performing LTE sidelink functionality testing on the communication link to the C-V2X module. This is used in conjunction with the R&S SMBV100A vector signal generator, which simulates the GNSS signals of global positioning services such as GPS, GLONASS, Galileo, and BeiDou. Implementation of the GCF-approved protocol tests are provided through the R&S CMW-KK550 software package. As a supplier of conformance testing solutions fulfilling the GCF specifications for over 20 years, Rohde & Schwarz is well positioned to support developers and engineers that are new to automotive C-V2X module testing. At the same time, existing customers and test houses can leverage their current hardware investment to support C-V2X compliance testing through a simple software upgrade.